Battle Fatigue: Is There Nothing New to Say About AIDS? 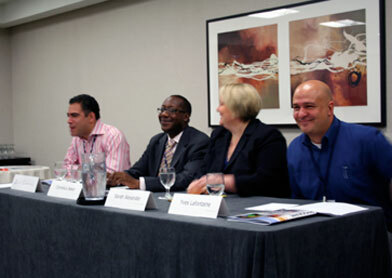 I moderated an exciting panel at the 2009 NLGJA annual conference in Montreal titled “Battle Fatigue: Is There Nothing New to Say About AIDS?” Unfortunately, the answer is that there’s still plenty to say. We had three amazing panelists. In the photo, from left, is me, then A. Cornelius Baker, who is the project director of the NIAID HIV Vaccine Research Education Initiative, AED Center on AIDS and Community Health, and who also was the executive director of the Whitman-Walker Clinic in Washington, DC, and was the executive director of the National Association of People With AIDS; Sarah Alexander, associate director of the HIV Vaccine Trials Network; and Yves Lafontaine, editor in chief of Fugues, a French-language gay magazine in Montreal. Our goal was to provide the latest news and hot topics in HIV/AIDS for the journalists in the audience to pitch to their editors. I am satisfied that we accomplished our goal. I moderated a similar panel last year at the NLGJA annual conference and was disappointed in the turnout. I’m happy to report that although overall attendance at the conference was down from last year, attendance at this year’s HIV/AIDS panel was up. For better or for worse, media coverage of HIV/AIDS has an impact on the spread of the virus. I’m glad that NLGJA gets it. Click here to read a live blog of the panel (scroll down the page to the fourth live blog).